Why did Sir Edmund Hillary and Tenzing Norgay climb Mount Everest? Because they could. 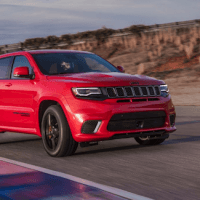 Why did Jeep build the new Grand Cherokee Trackhawk? 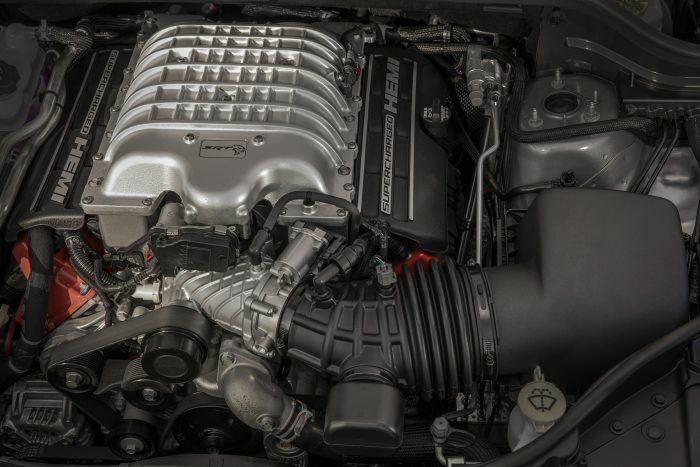 Because they had the Hellcat engine sitting there at their disposal and too much time on their hands. 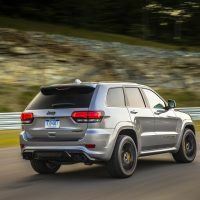 Does stuffing a 707 horsepower, supercharged V8 into the nose of the new Grand Cherokee make sense? 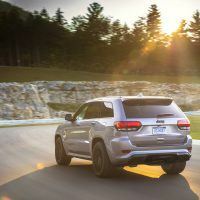 It does if you want the ultimate all-wheel drive vehicle that will launch you to 60 mph in 3.5 seconds. But it comes at a hefty price. 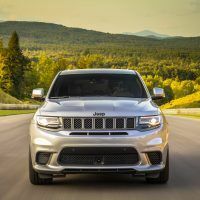 This weekend, we drove the insane 2018 Jeep Grand Cherokee Trackhawk! Yep, you read that right. 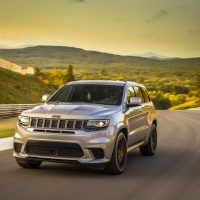 Jeep just stuffed a 707 horsepower V8 under the hood of the Grand Cherokee, called the Trackhawk, for performance enthusiasts. 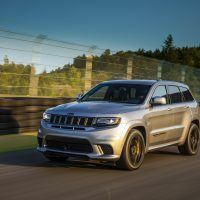 It’s more performance-focused than the existing 475 horsepower SRT. 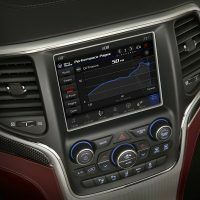 Other changes include a seven-inch touchscreen, now standard. 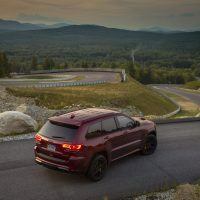 The 2018 Jeep Grand Cherokee Trackhawk ($85,900) comes with plenty of standard equipment, including an 8.4-inch Uconnect touchscreen, upgraded interior trim, and all the Grand Cherokee’s available safety equipment: adaptive cruise control, blind-spot monitoring, forward collision mitigation with automatic emergency braking, and lane departure warning. It also features keyless entry, a CD player, satellite radio, rearview camera, parking sensors, leather seating with a power front passenger seat, heated front seats, a power tailgate, and remote start. 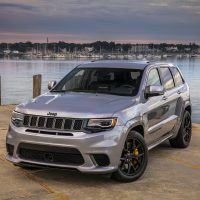 Options on this Trackhawk tester included a 19-speaker Harman Kardon stereo ($1,995), 295/45ZR20 BSW 3 Season tires ($895), and 20-inch Black Satin Aluminum wheels ($995). 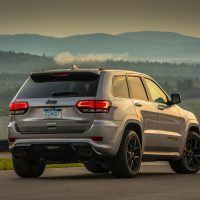 Total MSRP including destination: $90,880. 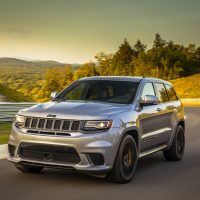 The Grand Cherokee Trackhawk comes richly equipped with materials and textures that match luxury rivals, such as real wood trim on the dashboards and doors. 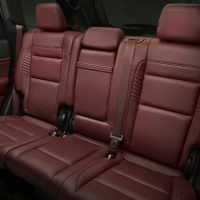 Extra comfort comes in the way of heated and cooled front seats, heated steering wheel, and heated second row seats. 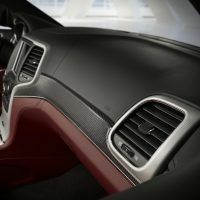 A sleek silver carbon treads along the instrument panel and doors, and the big console even has illuminated audio ports. Uconnect infotainment systems, with thier simple interfaces, rank among the best in our opinion. 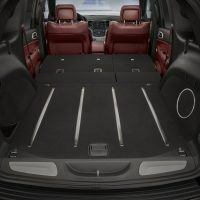 Up front, drivers and passengers get wide cushions with good bolstering for more spirited driving. The cabin is spacious enough for five adults, with good legroom all around. 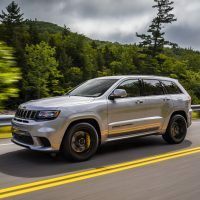 Six-footers have ample headroom, and the Grand Cherokee’s big doors open wide so climbing in and out is easy. 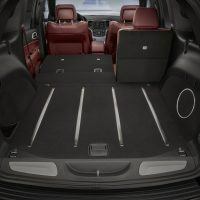 Cargo volume with the rear seats up is 36.3 cubic feet, which is more than enough space for your groceries or some camping gear. 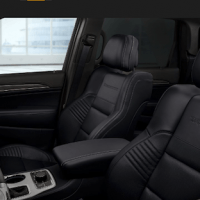 The seat backs recline 12 degrees, and then flip down with a lever for more cargo space. 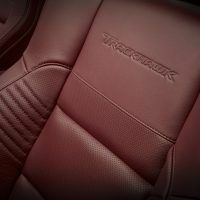 Powering the Trackhawk is the Charger/Challenger Hellcat-sourced 6.2-liter supercharged Hemi, developing an insane 707 horsepower and 645 lb-ft. of torque. 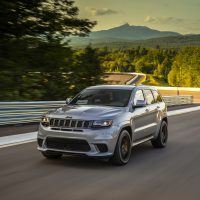 Trackhawk sees several suspension and drivetrain changes to handle all that power too. 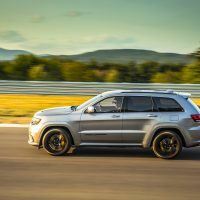 It gets new springs, active Bilstein dampers, a reworked version of the eight-speed automatic transmission, a new single-speed transfer case, and a revised rear limited-slip differential. 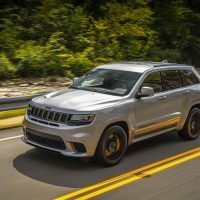 The yellow performance Brembo brakes peek out around the custom 20-inch black aluminum wheels. 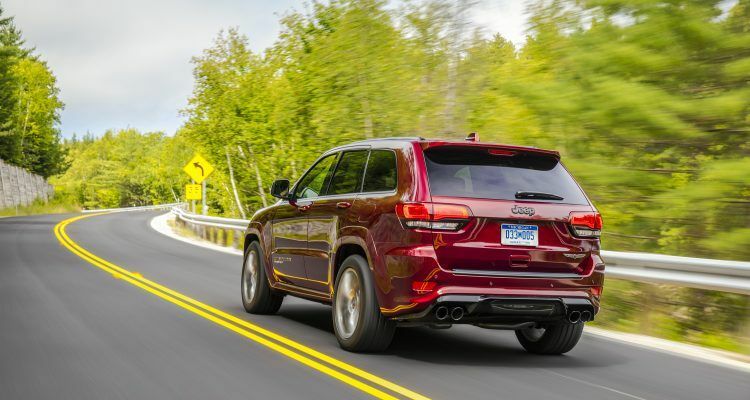 The powerful SUV gets an EPA-estimated 11/17 city/highway and 13 combined mpg. We aren’t sure what we actually averaged this weekend – we had our foot in the pedal the whole time. 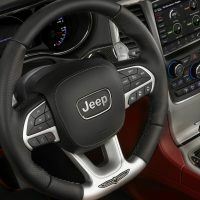 The first thing we noticed behind the wheel were the hood vents that signal the supercharged engine underneath. Forward visibility is good because the sloped hood and fenders make it easier to see the corners. The big square sideview mirrors transmitted minimal noise into the cabin from the wind, but our ears were enjoying the throaty growl from under the hood. 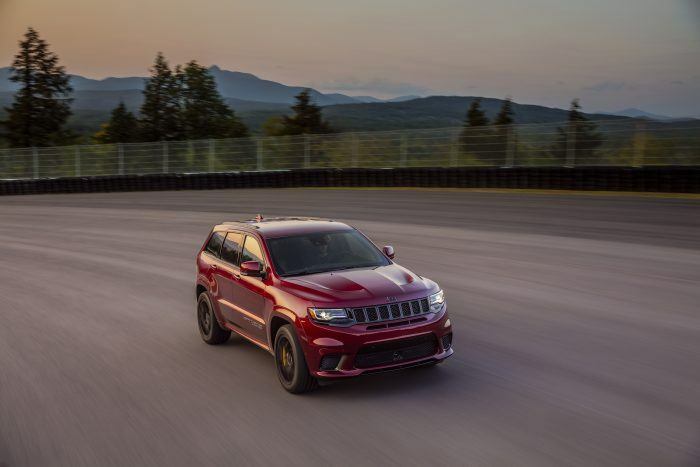 For an all-wheel drive SUV of this size, the Trackhawk is more than fast; it’s scary-fast. 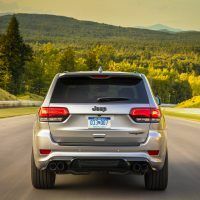 On the highway, you’d be hard-pressed to feel any difference in the ride expect for the 20-inch wheels and massive performance tires – that did give it a slightly firmer ride over the bumps, but otherwise things were mostly smooth. How can you drive a high-performance vehicle like this without mashing the pedal down? You can’t! How do you not get a speeding ticket? We had our head on a swivel all weekend looking for local law enforcement. 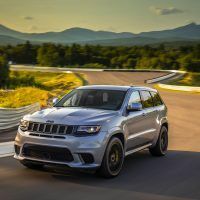 The Trackhawk’s massive power crackles from the quad-tip exhaust, and the supercharger’s whine it just too entertaining to pass up. We made liberal use of the large Brembo brakes that responded quickly when we needed to bring all that power to a stop. 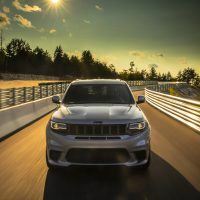 We aren’t sure there are many who need this much power, but for those that can afford $90,000, the Trackhawk will provide more entertainment per pound than anything on the road. 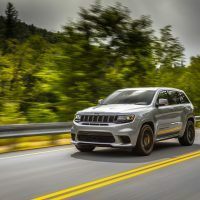 The 2018 Jeep Grand Cherokee Trackhawk is an over-the-top, high-performance SUV designed for a select few. Why would you want one? Because you want something insanely unique and can afford it. There’s nothing else like it! 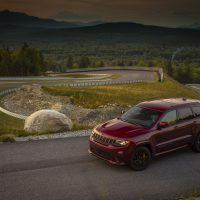 2018 Jeep Grand Cherokee Trackhawk Official Site. 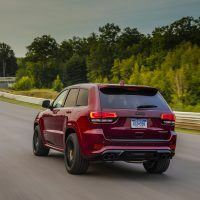 No Comments on "2018 Jeep Grand Cherokee Trackhawk Review"